About Us - Hydro-Tek, Ltd., is a licensed irrigation company specializing in the installation and service of automatic landscape sprinkler systems. We have served customers for over 13 years in the Garden State, providing top quality services to residential and commercial properties. We work hard to provide our customers with superior service and quality installations that have earned us a reputation that insures satisfaction and excellence. Our first concern is customer satisfaction on the service we provide for your home or business. Our knowledgable office staff are ready to answer your calls. They will schedule appointments for service or estimates and have answers for most questions regarding sprinklers and irrigation. 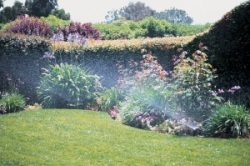 Irrigation System - We will design and install a complete or partial landscape irrigation system on your property. Our installation team will carefully and professionally install the system in a timely fashion. Landscape Lighting - We will design & install a landscape lighting system that will add beauty, value and safety to your property. We will come to your residence and conduct a low voltage lighting demo at no charge to you. Seasonal - We will winterize your irrigation system by completely blowing out all the water from all components, preventing damage due to freezing. In spring, we will turn your system back on and ensure that all components are functioning properly. Some things we do Differently! Educate you about your system. Remove our shoes when in your home. Offer a 10% discount when paying on the same day. Provide professional service with a smile! 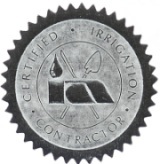 We are members of the Irrigation Association and are a Cetrified Irrigation Contractor. In addition, we have Certified Foreman, Certified Technicians and are Licensed in New Jersey, License # 0016767. 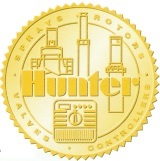 We are Hunter Preferred Contractors. SAVE TIME. No more having to remember to water or pulling the hose around or having to move the sprinkler. Your lawn gets watered even when you are away. SAVE MONEY. Over watering can kill shrubs and your lawn, which can cost you money. A new sprinkler system will save you the expense of having to re-landscape because of these mistakes. SAVE WATER. 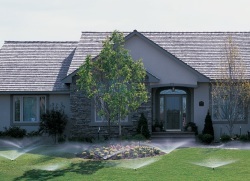 A new lawn sprinkler system will provide the right amount of water to your lawn. It is important to conserve water. Most homeowners use almost 50% more water than they need to when watering their lawns. CLOCKS - Also known as controllers, they are the brain of your system. 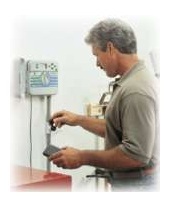 Easy to operate and program for your individual needs. Controllers efficiently operate whether you're home or on vacation conseerving water with carefree control. SPRINKLER HEADS - Designed for a variety of uses. They are professionally selected for your individual needs to keep your lawn lush and plants healthy along with proper care and maintenance. Hydro-Tek, Ltd. recommends only the highest quality sprinkler heads, including Hunter (pictured) and other quality manufacturers. AUTOMATIC VALVES - Valves are the heart of your sprinkler system. They are placed in a box under ground out of sight and wired to your controller to water your lawn & plants in different areas called zones. Using a solenoid device controlled by electricity from the controller, valves turn on and off the flow of water to the sprinklers. BACKFLOW PREVENTOR - Prevents water from your sprinkler system getting into your drinking water. City and State approved, they are required by all local government water departments. Installing an automatic sprinkler system is a complex project.